2) Thickening of the Nail: Seen frequently in the toenails of the elderly. Long term use of ill-fitting footwear / Neglect of the nails. Often presents with pain, but may progress to infection results in difficulty while walking. Local causes e.g. trauma or chemicals. 8) Also called as spoon-shaped nails. 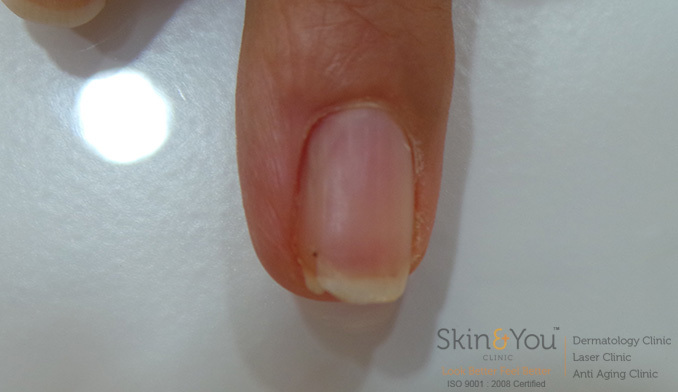 Nail has raised ridges and is thin and curved inward. Associated with iron deficiency Anaemia. We, at Skin and you, assess, examine and treat all dermatological conditions with utmost care.